1. What a manic, barmy contest. Wigan swept into a 20-0 lead and looked on course for a third successive win which would have taken them fifth in the table. Instead, they crumbled under Castleford's revival and the lead exchanged hands three more times during a dramatic second-half - Tuoyo Egodo's late try swinging the contest in Cas' favour, before Peter Mata'utia flattered the scoreline after the siren had sounded - to leave Adrian Lam's side ninth, just two points ahead of bottom-club Leeds. 2. At the start, and what a start by Wigan, who were 20-0 ahead from four tries inside 22 minutes. All four were scored down the lethal left edge - described by Adrian Lam as the best in Super League - and they posted two more down that flank by the end of the match. The link-up play between George Williams, Oliver Gildart and fit-again Joe Burgess borders on the telepathic at times - and Gildart, especially, was at his majestic attacking best. So what went wrong? 3. Castleford roared back into the contest and Wigan weren't helped by the loss of Jarrod Sammut, Joe Greenwood and Dom Manfredi during the contest. Big picture, a narrow loss at the Mend-a-Hose Jungle is not that bad - even the most successful sides struggle at the venue. But you sense that, in review, Wigan will watch the Cas' tries - especially the three close-range efforts down the middle early in the second-half - and say, "Yeah, that was soft defence from us... that one too... that one too..."
4. 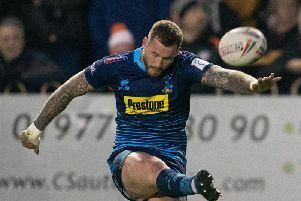 Zak Hardaker expected a hostile reception and he certainly got it. The full-back - suspended for taking cocaine on the eve of the Tigers' maiden Grand Final appearance in 2017 - saw every touch jeered and every missed-conversion cheered. He played pretty well, particularly in defence, and swallowed up all the kicks fired his way. 5. Finally, it was a great comeback from third-placed Castleford. As 20-0 down, they could have crumbled, but they lifted the intensity. Without their first-choice spine they played to strengths, relying on power rather than panache to roll down field time and again. Fans won't have to wait long for a rematch - the Tigers visit the DW Stadium on Saturday, April 27.